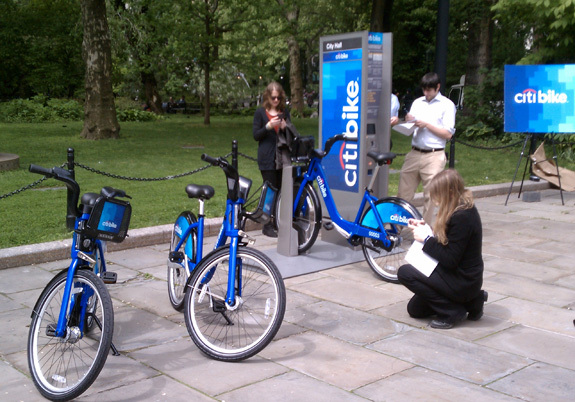 Banking giant Citi will be the primary sponsor of New York’s bike-share system, set to launch this summer with 600 stations and 10,000 bikes in Manhattan and Brooklyn. Mayor Bloomberg and NYC DOT Commissioner Janette Sadik-Khan made the announcement a short while ago at City Hall, where bikes and a logo-adorned station are temporarily on display. We’ll have more on this morning’s event later today. For now, enjoy the photos — and congratulations to reader Mike, who called it. 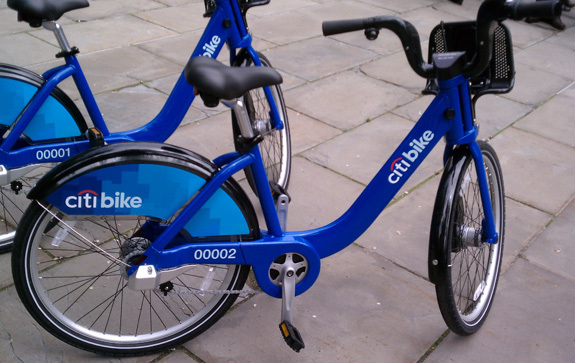 Regardless of what one thinks of Citibank, it seems a very good name for NYC bike-share and the bikes look good. The usefulness of this system for swarming protest tactics will make the irony of a Citi sponsorship delicious. Any details out yet on the duration of the deal or the price tag? @73a27bc20bf5ce1dee9a6e325a0eecec:disqus 5 years, $41 million from Citi. $6.7 million from MasterCard. At first I thought this was a simple case of greenwash http://understory.ran.org/2012/05/01/dirty-money-u-s-banks-at-the-bottom-of-the-class/ (Citi is no. 3 in “Filthy Five” from Rainforest Action Network) but then I recalled that Bloomberg Philanthropies has funded anti-coal activities http://www.washingtonpost.com/national/health-science/mayor-bloomberg-gives-50-million-to-fight-coal-fired-power-plants/2011/07/20/gIQAEKKURI_story.html, but without knowing more it looks rather strange, don’t ya think? Can’t wait until the Spring of 2013. Seems like an invitation to start calling them Sh—yBikes. I hate the “pay for itself,” “public-private partnership” (=milking taxpayers while pretending you’re giving, giving, giving) approach. Not criticizing DOT here–what real option did they have?–just lamenting the shortsighted, self-destructive mentality of the political overclass that demands that we do things this way. @dporpentine:disqus I’m ambivalent about this. With a view from Montreal, city ownership comes with it’s own slew of problems. It also does a complete end-run around the question “Why is the city paying for this?”, which made implementation not a fight at all. 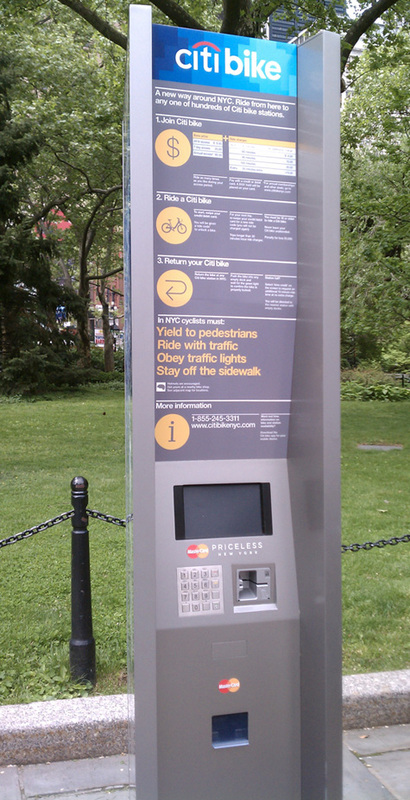 Is it true that all the docking stations will be front of TBbank, CapitalOne, Bank of America and Wells Fargo. Also is it true that Citibank account holders may get a discount on the membership/rental fee. Maybe they will change the name to New York Citi – if citibank pays enough to buy the brand. Is every bike going to have an ad for Citi on it? If so, this makes the program far less interesting — who wants to be a pedaling advertiser for any bank, much less Citi? Ever look at London’s bike share? DOT has been showing the London bike around for months but no one noticed “bank” til today? I hadn’t actually looked at the London system, but I see that Barclay’s is all over it. Oh well. Looks nice, except for the wacky pricing. It’s great for everyday users, but it seems like a missed opportunity to promote cycling among non-cyclists such as myself. I was hoping to try it out, but not at that price. @dporpentine:disqus Sh—y bikes sounds right to me. I might consider a $10 daily fee, or even an annual membership, if they were Quest velomobiles, but not those things. Come to think of it, why not velomobiles? Besides being fast, some of them are totally enclosed for all weather protection. Next Tuesday, September 12, Citi Bike operator Motivate will begin installing 140 new stations and 2,000 bikes in Astoria, Crown Heights, Prospect Heights, and Harlem up to 130th Street, marking the final phase of planned expansion for the four-year-old bike-share system.